PoPville » Dear PoP – Metro Real Time Bus Service is Spot On! Dear PoP – Metro Real Time Bus Service is Spot On! 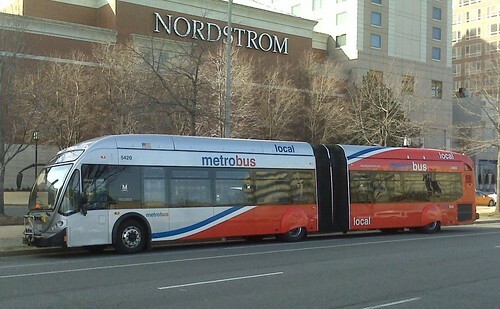 Crazy new streetcar-style Metrobuses, originally uploaded by jsmjr. Program re-started today. Had some glitches in earlier trials. Works on-line and by phone…. I’m not much of a bus rider but this sounds awesome. Anyone else give it a shot yet? Did you have similar results? There is also a press release from DDOT announcing “Where’s My Bus” for the Circulator, after the jump. Washington, D.C. – Mayor Adrian M. Fenty along with the District Department of Transportation, Office of Planning, and Office of the Chief Technology Officer today launched a mobile technology application designed to provide residents, visitors, and commuters with a convenient and efficient tool to assist in their day-to-day travels within the city. “Where’s My Bus?” is a new mobile application for DC’s popular Circulator bus and is one of the first tools to provide real time information on the location of a rider’s bus, through a simple, easy to use interface. By simply going to http://circulator.dc.gov from any Internet-ready mobile device, the new Where’s My Bus? mobile application lets riders select a Circulator route and bus stop to find out how close the next bus is whether they are at home, the office, or on the go. The application uses real-time GPS data so bus riders can have up-to-the-minute information on all Circulator buses at their fingertips. The DC Government developed the Circulator bus mobile application in house, completing the project remarkably quickly and at minimal cost – it was a joint agency effort to improve the public transit experience using available staff expertise and resources. As an “open source” application, any municipality with a similar bus system and real-time GPS data can adapt and implement the application at minimal cost to increase the convenience of using transit and ultimately improve mobility in our urban areas. All Circulator data is being made publicly available to encourage other developers in our area to build their own, better applications. The intention is that the tools made available by the District Government would be replicated by other transit agencies across the country, allowing it to transform the way transit information is shared. The DC Circulator surface transit service was launched in July 2005 and has transported more than 8 million workers, residents and visitors quickly and inexpensively around central Washington since its inception. The Circulator has five routes connecting through the District’s commercial core, the 43 buses have low floors, multiple doors for easy on-and-off service, and large windows for easy viewing along the route. The Circulator has a simple fare structure of $1 per ride making it easy for people to hop on the bus and pay cash, or purchase tickets in advance online or at curbside multi-space parking meters. Circulator buses arrive at stops every ten minutes throughout the day. Additional information and a link to the “Where’s My Bus” application can be found on the official DC Circulator web site at www.dccirculator.com. Also in development is the DC Circulator Where’s My Bus for iPhone™ with advanced features, as well as an updated website highlighting all the great destinations that can be reached by a quick ride on the Circulator. The iPhone™ app adds a cool user interface and uses the iPhone’s™ location-aware technology to find the closest stop to a potential rider. The iPhone™ application is scheduled to be available in late summer.